Like A Rock. Toshiba’s Qosmio X775-Q7272 might epitomize everything that comes with its 17.3-inch form factor, but solid build quality and impressive specifications make the laptop capable of handling virtually anything. The Toshiba Qosmio line has always been kind of an anomaly in the marketplace. These notebooks were the biggest of the big, and plenty powerful to boot. With the X775 Toshiba has reevaluated some of their design points and the result is a leaner, meaner gaming machine. 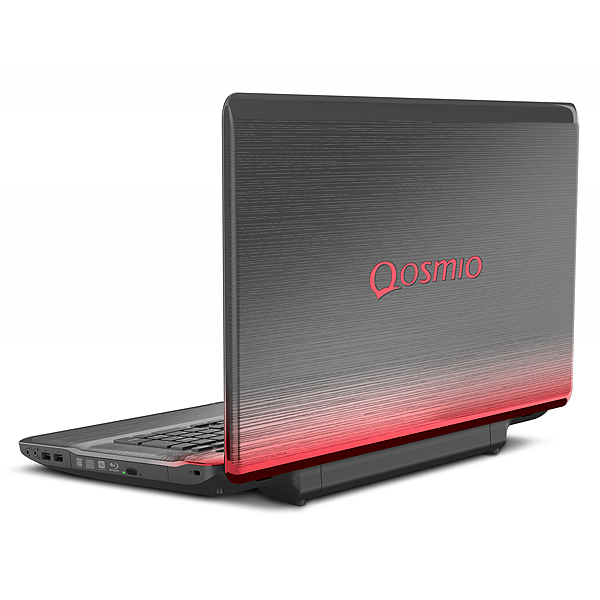 The Qosmio has gone from being a gloss-infested blinged-out curiosity into a real competitor, its price having dropped as much as its weight. 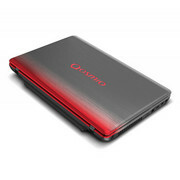 In the summer of 2004, the first Toshiba Qosmio made its debut to much fanfare. Billed as a multi-media enthusiast’s ultimate playground, the product line has grown and stretched over the last seven years. At various points, it has turned its focus more towards gaming than just audio and video. The first models featured 15 inch displays, then grew to 18 inches, and today, have settled back into the more typical 17 inch size that this notebook genre occupies. Today’s review focuses on the Q7272 variant of the new X770 model series. 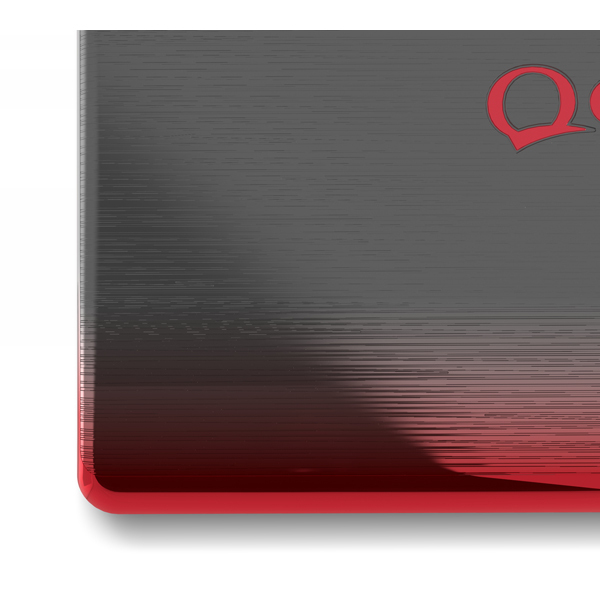 A slight upgrade from the baseline Q7270 model, the Q7272 will run customers an additional $300 to step up to an Intel Core-i7 processor and the larger hard drive. Last year’s X500-model reviewed fairly decently at Notebookcheck, but failed to meet all of its potential as the gigantic 18.4 inch model was saddled with a display that was only so-so-bright and induced nasty reflections even indoors. With competitors like the Asus G74-series on the market, we were interested to see if the new Qosmio could hit that perfect balance between price and performance in this wickedly competitive market sector. The Qosmio X775 chassis is solid, while also a bit gaudy for our tastes. That being said, the current finish, dubbed a Fusion X2 Finish in Red Horizon, is subdued in comparison to some past Qosmio models, which have always striven for a bit of noticeability in their design. Which is good, as the Red Horizon finish is the only color-scheme available. Regardless, the feel of the chassis is quite nice, with a textured surface lined into the reinforced plastic of the palm-rests and keyboard deck. While it may not be as high-quality as an aluminum chassis, it about the best we have seen laptop construction that is based on plastics. It is not quite on-pat with the design and materials of the Asus G7X-series, but Toshiba gets a plus here for coming close. There is absolutely no give in the keyboard and main deck. The same cannot be said of the display and lid, as there is a lot of flex in the display. Admittedly, the lid seems a bit more resistant to direct, point-pressure on the lid, such as would be exerted by a finger pressing down on it when closed, but not by much. Workmanship appeared sufficient, with no tell-tale gaps around the optical drive or other non-unitary seams. The display hinges are also sufficient, but that is it. No large unitary hinge or wide dual-hinges as there are on some other laptops in this price range from other manufacturers. The hinges on the Qosmio’s display are comparatively thin, even to models in HP’s Pavilion and Envy series. The battery is a large, downward-extending nub-type that raises the laptop keyboard to a very comfortable typing angle. 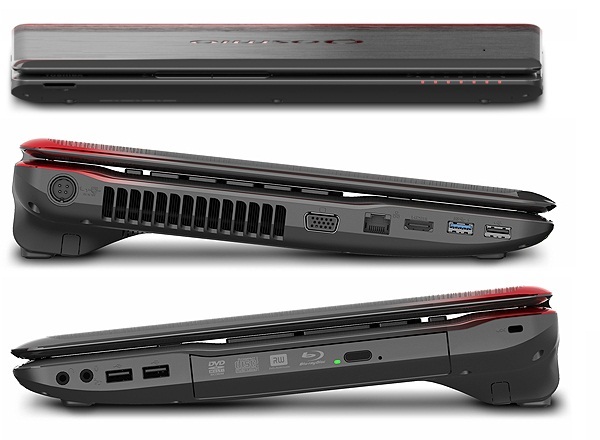 This is a nice differentiation from other competitors in the category, and stands out from the near flat design of the Asus G74. While that product features a 5 degree down-angle on its chassis, it is not as comfort-inducing as the Qosmio’s steeper lean. One might think that the battery extension would be troublesome when it comes time to stuff the Q7272 in a laptop bag or backpack, but we have generally found any bag large enough to swallow a 17-inch model laptop to be sufficiently over-sized so that this would not be a problem. In this day and age when connection interfaces are few in number, the X775 features the needed inputs and outputs for any gamer to get their job done. The notebook features 1 X USB 3.0 port, and 3 USB 2.0 ports. For video out, there is both VGA and HDMI. Audio ports include both headphone/speaker out, and Microphone inputs. Port arrangement is a mixed bag, and user like or dislike will depend on taste. The left side features 2 of the USB ports, the HDMI and VGA ports, Ethernet, and the Power Supply connector. The USB ports are near the front edge, and are aligned horizontally, with ample space so that putting two USB thumb drives in concurrently should be feasible without obstruction. Users who always place the laptop on the right side of an external monitor will not mind the left-side mounted video-out ports. However, those same users may not prefer the Ethernet port mounted in the middle of the video outs. Side-mounted Power Supply ports should also be mated to a right-angle connector on the Power Supply itself, whereas the Qosmio’s Power Supply connector is straight. The right side of the laptop features 2 more USB ports, again, mounted near the front edge of the laptop, and the audio input and output ports. As with the left side, the port arrangement should not present any concern from any obstructions being created when the ports are used concurrently. Finally, in a good design choice, Toshiba placed no ports on the laptop’s rear panel or edge. In testing against the USB interface, the Qosmio maintained a 32.2 MB/sec average transfer rate to a 250GB SimpleTech external USB hard drive. On its own internal drive, the Toshiba maintained an 87.6 MB/sec average, Measurements were taken in HD Tune. Video output over VGA looked okay, but noticeably less sharp than images did on the laptop’s own display. Our review unit did not come with any special add-ons in terms of accessories, what you get in the box is the laptop and the poer supply and that is it. There is also not that much in the way of specialized accessories for the Qosmio line. On the main Qosmio page, Toshiba’s Direct website only shows RAM modules (available at a pricey $55 for 4GB; the MOST expensive compatible 4GB module on Newegg was $25 at the time of this review), a gaming backpack capable of swallowing an 18” laptop, and a USB docking station. 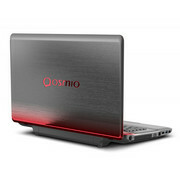 Once you get around to shopping for a specific model of the Qosmio, there are some more options, but they are standard fare and nothing specific to Toshiba or the Qosmio line. Toshiba includes a lot of pre-installed software, including: Corel WinDVD, Chrome, and several of their own applications. There is a full page’s worth of pre-installed software directly from Toshiba that can be found in the Programs and Features are of the Control Panel. That is a staggering amount of bloatware. There are a very small number of bright spots, like the fact that Skype comes pre-installed. However, all-in-all, it is likely that the first thing anyone might want to do with this blow away the current install, and then get a stock version of Windows 7 and install it . The Qosmio comes with a standard 1 Year Manufacturer’s Warranty, so if you experience troubles within the first 12 months, you can submit an RMA and go through the process for a repair. For $79, Toshiba offers and expanded Warranty. It is 12 months, but those 12 months are concurrent with the standard warranty that is already included. I did not find an option to purchase a warranty that extends beyond the first year. The expanded warranty covers the laptop for accidental damage, not just manufacturing defects, and also moves your laptop to the front of the repair queue. 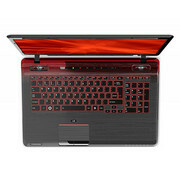 The additional coverage must be purchased within the first 30 days of buying the laptop itself. If you buy it on the 30th day, the coverage period dates from the original purchase date of the laptop, so you will be paying for 12 months of coverage, but only directly experiencing 11. This seems to be a less than optimal warranty scheme and buyers might be able to find better after-market warranty deals elsewhere. The keyboard layout is about as close as you can get to a standard US keyboard on a laptop. F-keys are spaced across the upper row in groups of four. The Home-End-PGUP-PGDN keys are all the way to the top-right, right over the keypad, which could be troublesome for some touch-typists, or gamers who like to map these keys to game functions. The Space bar is also only about as wide as four keys, which seems small given the amount of real-estate available for the keyboard. Key size is adequate, but they are smaller than the keys on a MacBook Pro or an HP Envy 14. There is not a lot of travel to the keys, and with the long reach from the palm rest and touch-pad, this may not be the most optimal of keyboards for speed typing. One major plus is that the main deck of the keyboard is rock solid, and there is virtually no depression that occurs when striking the keys, even the ones near the center of the keyboard, which is where most laptops have the most give in the keyboard deck. The trackpad area is slightly textured. Not quite to the same degree as the rest of the tablet interior, but sufficient to give the user some awareness of where they are on the trackpad. One thing that is missing is that there is not defined scroll area, rendering any scrolling capability of little use as you will never be certain your finger is in the right area. The trackpad is, again, smaller than the same surface area on laptops with smaller screens and chassis. Toshiba includes a button for disabling the trackpad as a hardware implementation. I always prefer a hardware switch for toggling the trackpad on and off. I have disabled my trackpad too many times in software while using a USB mouse, then picked it up and travelled with it, turned it on, and the trackpad is still off. A hardware switch saves a user who does this a lot of time. The trackpad buttons do not have a lot of travel and feel cheap, especially in comparison to the rest of the laptop’s build quality, but are serviceable. We noticed several instances of the trackpad not tracking perfectly. Most multi-media and gaming enthusiasts will use an external mouse with this laptop, however we would still expect tracking to be better than our testing showed. Toshiba includes a row of capacitive media control buttons near the top edge of the keyboard deck. There are buttons to launch the web browser, turn Wi-Fi on and off, start playback of media, turn of the keyboard backlight, and control the volume. While not all of these may be useful, there are several functions that are nice to have a hardware solution for rather than having to mouse through menus in Windows to get the same functionality. This particular model of the Qosmio comes with a 1600 X 900 display. It is nice that customers will get a display capable of rendering a 720p picture to go along with the included blu-Ray drive. Still, a display capable of rendering 1080p content would have been much better. Some of the 3D versions of the Qosmio line come with 1920 X 1080 displays, but, of course, those models are more expensive. Color saturation of the display was quite excellent. In video playback, colors were warm and on-screen action looked remarkably good. There were little or no issues from the glossy-type display. There was very little light bleeding in from the edges, and what was visible was not of an amount to be distracting. Video playback of online HD videos looked sharp. Blu-Ray playback via the included Corel WinDVD was not as sharp as we would have expected. With AVG Anti-Virus installed, one of the application's components was detected as a malware threat. Even when we uninstalled WinDVD, some BD discs would not play. Mouse Control was not enabled in some titles and we had to navigate around the menu using keyboard controls. All-in-all, it was not a very enjoyable out of the box Blu-Ray experience and we would recommend using a self-chosen application for Blu-Ray playback. Additionally, because the display is capable of less than full 1080 resolution, the maximum resolution of HD content is not able to be displayed. Viewing angles on the display are nothing to brag about, whcih should, perhaps, not be too surprising given the cost. Vertical viewing is onyl visible withing about a +/- 60 degree angle off- center before colors start to become washed out. Lasterasl viewing angels are about the same. 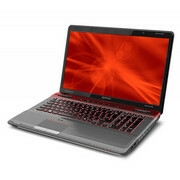 The Toshiba Qosmio X770-Q7272 is equipped with an Intel Core i7-2630Qm CPU running at 2.00 GHz. To complement this burly mobile processer, Toshiba pairs it with 6GB of DDR 1333 RAM, Windows 7 Home Premium 64bit, a BD-ROM, ReakTek HD Audio processor, and 2 X 500GB Hard Drives spinning at 7200 RPM. Not bad for a gaming rig on the lower end of the price range for this genre. There are a multitude of options in terms of pre-configured components for the Qosmio line. 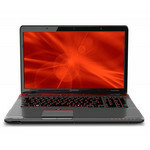 Toshiba predominantly offers them in set packages, so you can buy whatever package suits your fancy. We ran benchmarks on Crysis and World of Warcraft. At 1600 X900 resolution with 8X AA, Crysis ran around 27 FPS. We left all of the settings at high and checked frame-rates again at each multiple of AA and saw very little variance. The GeForce 560GTX GPU seems to be very insensitive to AA, at least within Crysis. Disappointingly, there were indications that some component was not as strong, as when we enabled FRAPS recording in the background, the game slowed to a mere 15FPS and became essentially unplayable. The Qosmio handled WoW well enough, running at 60FPS at the default settings. Cranking everything to make left the game running at a still very playable 38 - 42 FPS, although there was noticeable choppiness when more action was onscreen, or when forest vegetation became increasingly dense. 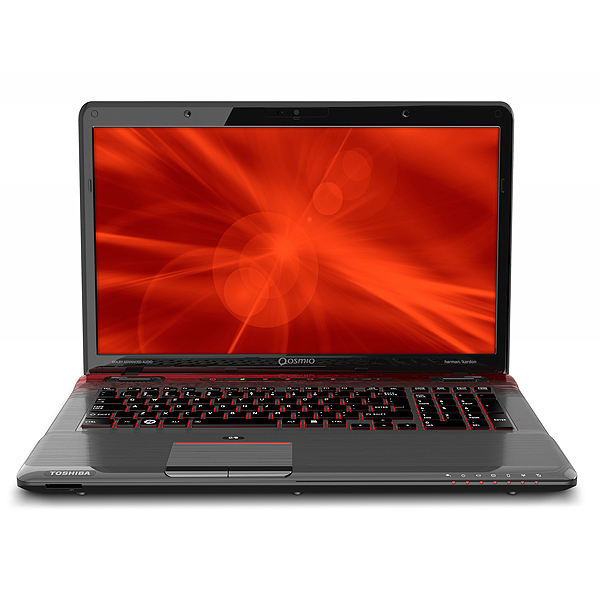 One thing we can say is that this laptop has some of the best audio of any we have tested. The Harmon Kardon speakers and sub-woofer combine to make a great gaming experience as far as laptops go. While gaming and running at max settings for some of our benchmark tests, the fan had a noticeable low-frequency hum to it, but this was only truly perceptible during menuy and loading screens. Once the game was in run, there was far too much to enjoy in the speakers' audio quality to discern any fan noise. While I have been able to feel the heat from some high-performance laptops right through the keyboard, the deck of the Qosmio Q7272 remained cool to the touch throughout testing.